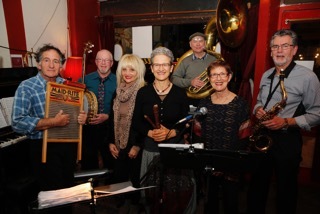 Sweet Ade is a lively, fun and “different” 6 piece jazz band. We play a colorful array of instruments -recorder, ukuleles, clarinet, saxophones, piano accordion, washboard, drums, sousaphone, piano, and vocals. We’re available for all kinds of functions including weddings, parties, corporate events and house concerts. We’ve been in the business since 2011. We promise to make your event enjoyable and memorable. This entertaining band has wide appeal not only to those with a specific jazz interest, but to people not necessarily familiar with jazz who will be surprised and delighted by our happy, engaging performance. •	We play in Melbourne and surrounds, including country Victoria. •	We are fully self sufficient with all our equipment. •	We can play indoors or outdoors. •	We require access to power.